Over the last decade, marine spatial planning (MSP) has become an increasingly accepted approach to achieve multiple objectives for ocean management. At least 13 countries have approved marine plans covering 7% of the world’s Exclusive Economic Zones and Territorial Seas. By 2025, marine plans may be implemented in more than 40 countries around the world including several Small Island Developing States (SIDS) (Smith, 2017). MSP presents several significant challenges including choosing appropriate data, models and decision support tools to inform the planning process. Advances in approaches to, and spatial tools for, multi-objective marine planning are necessary to address particular challenges posed by the different spatial, temporal and socio-economic scales of uses and activities in a given planning context (De Santo, 2013). To date, almost 100 decision-support tools for MSP have been developed (Beck et al., 2009; Bolman et al., 2018) but there is varied success for using these tools during real-world planning processes, particularly in data-poor geographies and SIDS (Pınarbaşı et al., 2017). Given that MSP is a public and participatory process to address ecological, social, and economic objectives with stakeholders in a transparent way, decision-support tools need to be able to estimate, visualize, and evaluate trade-offs among overlapping uses or conflicts among activities. The science and practice of developing and using technical and spatial tools for MSP is evolving, including more explicit consideration of ecosystem services (Arkema et al., 2015) and approaches to conflict analysis and management. Fast-tracking of MSP processes globally has also provided an opportunity for spatial tools to advance in their capacity to address multiple objectives and move from sector-specific to multi-objective planning. Here, we present recent advances in practical approaches and spatial tools from several ongoing marine planning efforts. These studies were presented during two special sessions at the Society for Conservation Biology’s International Marine Conservation Congresses (IMCC) in 2016 and 2018 and involve a range of interdisciplinary approaches, contexts, and geographies. We provide case study examples from six countries, spanning seven broad themes relevant to any multi-objective MSP process. In Canada (British Columbia), we demonstrate that indigenous and local knowledge should inform planning goals and objectives, and that evidence-based approaches can reduce user conflict; in Belize, we show how simple ecosystem service models and scenarios can facilitate multi-objective planning; in the United States (California), trade-off analyses have helped balance diverse objectives; in the Seychelles, we demonstrate how ecosystem services may assist planning for high value-data poor Blue Economy sectors; in the United Kingdom, we used game theoretic decision rules to help deliver fair, equitable and win–win spatial allocation solutions; and in South Africa, we show how strategic mapping products can facilitate decision making amongst stakeholders from different sectors. Although the approaches presented here are not comprehensive and do not represent a systematic review of all active processes around the world, they reflect an assortment of actual on-the-ground experiences that we believe are broadly relevant and can contribute to the evolution of MSP today. People who live and work on or near the ocean observe changes over their lifetimes and can also accumulate generations of knowledge regarding previous baselines of marine resources. In the case of Indigenous peoples, wisdom and practices are passed down through generations, for example, in the form of dances, stories, traditions, and Indigenous laws (Berkes, 2018). This local and Indigenous knowledge should be considered paramount to informing MSP goals and objectives. Our research illustrates this point. We developed community–academic research partnerships (Ban et al., 2018) to identify changes in size and abundance over the past 50 years of some focal species in order to inform MSP and fisheries management. The partnerships were created at the request of four First Nations (Indigenous peoples) on the central coast of British Columbia, Canada. Two species were of particular concern to them (Dungeness crab, Cancer magister; and Yelloweye rockfish, Sebastes ruberrimus) because these species are culturally important yet also targeted by commercial and recreational fisheries. Although our research focused on these two species, the methods are applicable to any species. We used a mixed methods approach, combining semi-structured interviews with ecological surveys and modeling to gauge the changes in these species between peoples’ living memories (i.e., the first-time participants remember fishing for these species in their youth or early adulthood) and recent years. Ecological surveys and stock assessments either did not exist at all or were started only in the 2000s. We found that size (Yelloweye rockfish) and abundance (both species) had declined substantially, and that in some cases First Nations were unable to meet their needs for their constitutionally protected right to fish for food and for social and ceremonial purposes (Ban et al., 2017; Eckert et al., 2018). These results were brought by the First Nations partners to policy discussions, and they have resulted in changes to spatial management. More specifically, important crab fishing areas were closed to commercial and recreational fishing, and findings about the changes in sizes of Yelloweye rockfish are being incorporated into the latest assessment of this species of special concern. These studies illustrate the importance of local and Indigenous knowledge in informing goals and objectives in marine planning. As is commonly the case globally, scientific surveys of these and other important species either did not exist or were started only recently. Without the information gathered from interviews, shifted baseline (e.g., significantly reduced biomasses of important species) might have been used to set default objectives (Pauly, 1995) in the absence of historical information. The community–academic partnerships were an effective trans-disciplinary approach to filling the data gap and engaging people in thinking about future scenarios for these species. On Canada’s North Pacific Coast, the Province of British Columbia (BC) and 17 Coastal First Nations recently co-developed marine spatial plans to support sustainable economic development and a healthy marine environment across more than 100,000 km2.1 There were four sub-regional planning areas: Haida Gwaii, the North Coast, the Central Coast, and North Vancouver Island, together comprising the North Pacific Coast of BC. But effective implementation of each marine plan requires evaluating how key marine uses interact, including linkages on land and under global environmental change (Marine Plan Partnership for the North Pacific Coast [MAPP], 2016). We worked with First Nations on the Central Coast to identify priority income-generating activities in the Great Bear Sea and adjacent Great Bear Rainforest, identifying and modeling relevant abiotic and biotic conditions, to be used in an ecosystem services approach to evaluate potential environmental and economic synergies and trade-offs. The two highest-priority activities to emerge were shellfish aquaculture (for geoduck, scallops, and oysters) followed by nature-based tourism (bear-viewing); we focus here on shellfish aquaculture. Shellfish aquaculture has the potential to meet local and regional objectives regarding income generation and employment while also supporting the global demand for seafood. While parts of southern BC have successful shellfish aquaculture industries, the Central Coast does not. However, shellfish has been important for food, social and ceremonial harvest for Coastal First Nations across the North Pacific Coast for millennia. Exploring the development of this industry (specifically Japanese scallop, Patinopecten yessoensis; and geoduck clams, Panopea abrupta) was identified as a top priority among Coastal First Nations, provided it did not negatively affect other activities including established, growing and potential industries such as forestry or nature-based tourism, and that it would remain viable with changing ocean conditions (reviewed in Holden et al., 2019). We defined the range of abiotic conditions for successful scallop and geoduck aquaculture, to help identify the suitable natural locations to optimize growth and minimize mass mortality events. Through interviews with members of the scallop and geoduck aquaculture industry and researchers, we identified the tolerable and most favorable parameters for substrate, depth, temperature, salinity, tidal speed (both species), productivity (geoduck) and wave height (scallop) (Lancaster, 2017). This information was used to inform habitat suitability models for both species in the Central Coast and would be used to compare current aquaculture zoning to areas and variables important for nature-based tourism (e.g., visual quality, beach access and locations to see bears). We are using our results to recommend zoning that minimizes potential conflicts and maximizes compatibilities in linked marine, coastal and terrestrial environments. Combined with community engagement, this iterative process can adaptively manage multiple uses and activities to support human well-being, governance and ecological integrity. Marine spatial planning processes are demonstrating how scientifically credible models and maps of ecosystem service production are helpful for balancing competing uses such as tourism, renewable energy, and commercial fisheries (Guerry et al., 2012; Arkema et al., 2015; Ruckelshaus et al., 2015). Ecosystem service modeling typically begins by quantifying the risks of human activities to the structure and function of natural habitats (Arkema et al., 2014), followed by modeling the benefits provided by natural habitats for people’s livelihoods and well-being through ecological production functions. By pairing multiple ecosystem services and metrics with spatially explicit scenarios that compare alternative management options, it is possible to highlight how proposed marine spatial plans create synergies and trade-offs among activities in space. This approach to ecosystem service modeling was exemplified during the creation of the Belize Integrated Coastal Management Plan (Coastal Zone Management Authority and Institute [CZMAI], 2016). During the planning, teams of researchers, practitioners, and stakeholders evaluated how human impacts on coral, mangrove, and seagrass habitats would change the potential for ecosystems to provide coastal protection, tourism and lobster fishery benefits under three alternative management scenarios that promoted either habitat conservation, coastal development or “informed management” (Arkema et al., 2015). As a result, the plan explicitly considers how coastal management can provide benefits to multiple sectors and stakeholders, given their local visions and values (Verutes et al., 2017). One important lesson to emerge from recent planning efforts is that simple process-based ecosystem service models and spatial tools can be more useful than traditional heuristic models. Simple quantitative models help planners prioritize information-gathering, build local capacity and align stakeholders and appropriate authorities (Rosenthal et al., 2015; Verutes et al., 2017). Furthermore, simple models allow for an iterative science and policy process—in which scientists, stakeholders, and decision-makers repeatedly re-evaluate proposed scenarios, predicted outcomes, and model assumptions throughout the planning process—and that can result in more robust marine plans (McKenzie et al., 2014). This iterative approach to co-creating scenarios, science and knowledge can produce more credible, transparent and effective tools that resonate with governments and stakeholders. A marine spatial plan that uses predictive models and trade-off analysis can better balance diverse objectives for the use of ocean space, including development of emerging uses like offshore aquaculture and wind energy, while minimizing negative environmental impacts (Lester et al., 2013). Leveraging analytical models enables consideration of a broader array of concerns and goals, more objective decision-making and transparency around costs and benefits of different spatial planning options. This assertion is demonstrated in a spatial planning analysis supporting the potential development of multiple types of offshore aquaculture in southern California (Lester et al., 2018b). The study developed spatial models of the predicted productivity and profitability of three marine aquaculture sectors (offshore kelp farms, offshore mussel farms, and finfish netpen farms), and linked these to spatial models of four existing sectors that represent important stakeholder concerns regarding aquaculture development: wild-capture fishery profits; the environmental health of the benthos given potential nutrient pollution from finfish farms; risk of disease outbreak among farms; and viewshed impacts from adding structures to the marine vista. These linked models were integrated with an analytical trade-off analysis that identified optimal spatial plans given a range of preference weightings for the different sectors. The analysis suggested thousands of optimal plans (depending on the preference profile), allowing value of individual sectors to be enhanced and negative impacts to be reduced relative to more conventional approaches to planning. For example, the analysis found that dramatic trade-offs are unavoidable only at very extreme levels of aquaculture development, and there are spatial planning options that would result in a significant new supply of seafood, providing billions of dollars in revenue, with small to no impact on existing sectors and the environment. Although California has implemented a statewide network of marine protected areas (MPAs) through a process that included the use of predictive models and trade-off analyses to help balance conservation goals with fisheries objectives (Rassweiler et al., 2014), the region has not engaged in spatial planning for offshore aquaculture or other emerging ocean industries. However, this analysis has informed some discussions about potential future aquaculture developments in California, and if the region were to adopt a proactive spatial planning process that leveraged the analytical tools presented here, it could help to reduce the hurdles to development caused by regulatory uncertainty (Lester et al., 2018a). MSP can not only catalyze the development of a new industry, it can also safeguard that development follows a sustainable, rather than environmentally precarious, trajectory (Gentry et al., 2017). More generally, with an inevitable industrialization of the oceans on the near horizon around the world, multi-objective planning using predictive modeling and trade-off analyses can help achieve best-case outcomes. There is an important need in multi-stakeholder MSP to identify current conditions and trends by compiling information for each sector (Ehler and Douvere, 2009). By compiling the best available information and representing stakeholder preferences in a Geographic Information System, it is also possible to identify missing data. Data gaps usually exist because the questions that need answering for an integrated and ecosystem-based marine spatial plan have not been previously asked or answered. MSP processes are relatively rapid; thus it is challenging to fill these gaps during planning, but they must be addressed to ensure equity amongst stakeholders (Fox et al., 2013) and to assess trade-offs (Yates et al., 2015). Some sectors, such as fisheries, use a common property resource and have a long history of regulation that requires collecting and sharing detailed information about their activities with managers (e.g., effort and catch value). These data often follow rigorous protocols that ensure confidentiality and can then be used to describe the sector’s value within an economy. As a result, maps of activities, values and preferences are often available for decision-support tools to use to inform zoning, minimize impacts, and maximize benefits (Kenchington and Day, 2011; Agostini et al., 2015). In contrast, other sectors, such as tourism, rely on public and private resources and have very different reporting requirements that limit the type of data they are required to share about their activities. Obtaining access to these data for a marine spatial plan can be difficult because there are no or limited existing protocols to enable sharing and ensure confidentiality, which in turn creates challenges to represent high-priority areas for an equitable and transparent process. In Seychelles, The Nature Conservancy is facilitating a MSP process on behalf of the government to expand marine protection, address climate change and support the Blue Economy for a 1.35 million km2 area (Smith et al., 2018a).2 More than 15 years of data were shared by the fisheries authority to create area-based values for that sector (Smith et al., 2018b). However, insufficient data were available for high-value tourism, the leading contributor to Seychelles’ gross domestic product (World Travel and Tourism Council [WTTC], 2017). To map high-value tourism, we measured the relative distribution and abundance of visitation throughout the 115-island archipelago based on the number of geotagged photographs shared on the Flickr social media website from 2005 to 2014 (Wood et al., 2013; Keeler et al., 2015). Using a recreation ecosystem service model, we observed that tourism was highest around the accessible beaches and dive sites on the main island. However, without additional data on how relative differences in visitation reflect absolute differences in user days or expenditures, we lacked critical information for valuing tourism. The lack of long-term datasets and previous characterizations of the tourism sector also led to unanswered questions about the appropriate methods for defining ownership, administration and natural geographic boundaries. Nevertheless, this was an important first step in the process to represent high-priority areas for a significant sector in Seychelles’ Blue Economy. Since these maps were produced early in the planning process, the MSP initiative provided opportunities to work with the marine tourism sector to fill data gaps. This, combined with our other experiences in Seychelles, leads us to conclude that spatial tools play many direct and indirect roles in the development of marine spatial plans by highlighting data gaps and supporting efforts to create a transparent, equitable decision-making process for all stakeholders. • It estimates a fair net gain in monetary terms, thereby overcoming the limitations of achieving a net gain through other already established methods (e.g., Flores and Thacher, 2002; Dunford et al., 2004; Zafonte and Hampton, 2007; Fischer et al., 2008). In this case, a goal of restoration and/or enhancement can be achieved by the MPA manager instead of the developer through the appropriate investment of the monetary compensation, thus making the whole compensation process more sustainable. Ultimately, the MPA’s “win” can be translated as a conservation benefit, enhancing the positive reputation of the developer (for example through green branding) and demonstrating a win–win approach. Building on a long history of terrestrial conservation planning, South Africa has been undertaking marine biodiversity mapping, spatial assessment and systematic conservation planning since 2004 (see for example, Lombard et al., 2007, 2019; Harris et al., 2019). Here, we share experience from two National Biodiversity Assessments3; a 12-year process to develop a representative MPA network (Sink et al., 2012; Sink, 2016); and 4 years of work to support new national MSP legislation. We share the maps that were most useful and had the largest uptake from the hundreds of input data layers and analyses produced through this work to assess biodiversity, plan for protection and support MSP over the last 15 years. We also distil key elements in working and communicating with maps to support MSP and conservation uptake. Essential maps that supported this work included a National Map of Marine Ecosystem Types; maps of spawning and nursery areas of commercial fisheries; maps of the distribution and intensity of human activity (to inform cost layers and provide spatial surrogates for ecosystem condition); sector-specific maps reflecting key fisheries challenges (such as bycatch and incidental mortalities); a map of existing spatial management measures (including MPAs); and maps reflecting ecosystem threat status and protection levels (SANBI and UNEP-WCMC, 2016; Kirkman et al., 2019). We found that a continually adapting process was a key requirement and allowed us to update maps to reflect increasing knowledge and changing biodiversity and industry priorities. Such flexibility is critical to allay fears of reluctant stakeholders in sharing their sector-specific spatial priorities (such as the mining sector sharing their current priorities that may change with increasing exploration and prospecting) and also for scenario development that caters for predicted climate change effects, for example, the spatial migration of wild fisheries (Roy et al., 2007; Coetzee et al., 2008; Mhlongo et al., 2015). Many of our maps, particularly maps of ecosystem threat status, had uptake in sectoral plans, research and management to support fisheries eco-certification, and in environmental impact assessment. The IUCN is advancing such ecosystem red listing efforts to support assessment and planning (Bland et al., 2016), but South Africa’s national systematic approach covering all ecosystem types is novel. The systematic conservation plan that was used to identify focus areas for offshore protected areas is now being advanced into implementation (Sink et al., 2011), and protection in South Africa’s continental exclusive economic zone is being advanced from 0.4 to 5%. Key elements to improve uptake of these maps included translation of biodiversity maps into sector-specific maps to support biodiversity mainstreaming, to serve maps through online Biodiversity GIS portals4, to provide training to map users and finally the establishment of an annual stakeholder forum to support relationship building and information sharing across sectors. Our recent efforts have focused on new approaches to incorporate ecosystem services into MSP, including the identification of priority marine areas for food security. We found that our simple and powerful conservation and management messages, aligned with government priorities, had greater impact than complex planning products, and greatly enhanced and facilitated decision-making amongst multi-sector stakeholders. Marine spatial planning is a broadly accepted approach by most governments to better manage the sustainable use of ocean space, and indeed has even become a requirement by some public lenders to ensure sustainable economic development in coastal and marine waters (Smith, 2017). Scientists, managers and policy makers make broad calls for its use to better balance competition among marine uses and address a growing list of issues ranging from renewable energy and aquaculture siting to climate change adaptation and Blue Economy. We complement the already-burgeoning field of MSP by synthesizing very timely spatial analytical approaches and lessons learned from our collective experience working to advance the science and practice of MSP around the world. These lessons are not exhaustive and some of the work is still ongoing. We frame each of the case studies around the general utility of its approach, the importance of providing this information right now to the MSP practitioner community and facilitate the translation of these approaches to new planning processes. In particular, through elaboration of interdisciplinary tools, techniques, and approaches developed to inform real-world MSP processes, we demonstrate the key role that such tools can play to achieve multiple objectives in marine space allocation and management. This diverse collection of studies illustrates how these tools can be applied in different social, political, and ecological settings with different spatial planning needs and data and human resource availabilities. Commonalities that emerged from our studies include issues of process, as well as technical advances. MSP processes should emphasize transparency, the meaningful participation of all stakeholders, the use of the best available scientific and indigenous knowledge, and align with stakeholder visions, economic imperatives and government priorities. Multi-objective MSP tools should support real-world decision making by addressing issues of efficiency, equity/fairness and conflict, and have the ability to scenario-plan, analyze trade-offs and identify win–win solutions, as well as answer the “where” and the “how much.” Advances in the incorporation of ecosystem services into MSP are key aspects of the studies presented. None of the issues addressed in these case studies is unique to those particular contexts, and therefore the approaches presented here should be useful and transferable to other locations and other planning processes. In particular, our collection of approaches and tools demonstrates that multi-objective planning can be undertaken across a gradient of social-ecological complexity, and is not beyond the scope of under-resourced, data-poor regions. Additional resources for MSP practitioners and researchers can be found online (Table 1). Table 1. A selection of online resources for MSP practitioners and researchers interested in multi-objective planning approaches and tools. AL wrote the manuscript with case study inputs from co-authors. AL and NB were the leaders of the project and conceptualized the idea for research. JS provided strong conceptual input into the structure of the manuscript. NB, JS, SW, SL, KS, AJ, and ZK contributed to the manuscript study and provided the input for final editing. RT and HS contributed to the study led by JS and provided the input for final editing. 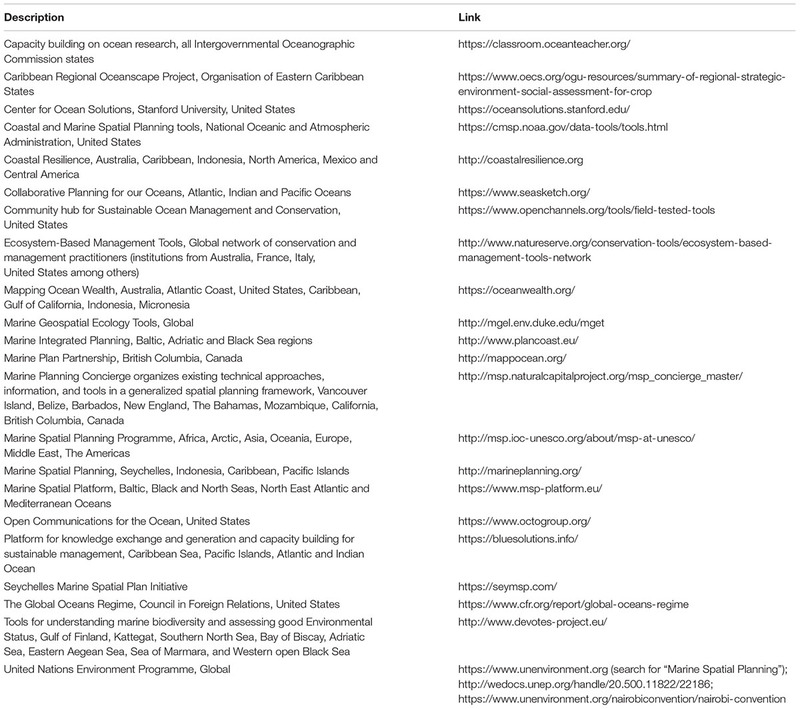 We thank the Marine Section of the Society for Conservation Biology for convening the Fourth International Marine Conservation Congress in St John’s, Newfoundland, Canada, in 2016, and the Fifth Congress in Kuching, Borneo, Malaysia, in 2018, at which we presented the studies described here and developed this collaboration. AL acknowledges the Department of Science and Technology and the National Research Foundation of South Africa for financial support to attend the IMCCs. NB acknowledges the Marine Environmental Observation, Prediction, and Response Network (MEOPAR), NSERC, SSHRC, and the University of Victoria. AJ acknowledges MEOPAR, the Central Coast Indigenous Resource Alliance, and Mitacs Canada. SW acknowledges funding from the Gordon and Betty Moore Foundation. SL acknowledges funding from NOAA SeaGrant/California SeaGrant and the Waitt Foundation. JS acknowledges funding from The Nature Conservancy. KS acknowledges the South African National Biodiversity Institute (SANBI) and the communities of practice convened by SANBI, funding provided through the African Coelacanth Ecosystem Program and the Foundational Biodiversity Information Programs of the National Research Foundation and the Pew Charitable Trusts. Beck, M. W., Ferdaña, Z., Kachmar, J., Morrison, K. K., and Taylor, P. (2009). Best Practices for Marine Spatial Planning. Arlington, VA: Nature Conservancy. Berkes, F. (2018). Sacred Ecology, Fourth Edition. New York, NY: Routledge. Bland, L. M., Keith, D. A., Miller, R. M., Murray, N. J., and Rodríguez, J. P. (2016). Guidelines for the Application of IUCN Red List of Ecosystems Categories and Criteria, Version 1.0. Gland: IUCN. Coastal Zone Management Authority and Institute [CZMAI] (2016). Belize Integrated Coastal Zone Management Plan. Belize: CZMAI. Coetzee, J. C., Van der Lingen, C. D., Hutchings, L., and Fairweather, T. P. (2008). Has the fishery contributed to a major shift in the distribution of South African sardine? ICES J. Mar. Sci. 65, 1676–1688. Department for Environment Food and Rural Affairs [DEFRA] and Joint Nature Conservation Committee (2011). Dogger Bank Special Area of Conservation Impact Assessment. United Kingdom: DEFRA. Ehler, C., and Douvere, F. (2009). Marine Spatial Planning: A Step-by-Step Approach Toward Ecosystem-Based Management. Intergovernmental Oceanographic Commission and Man and the Biosphere Programme. Paris: Unesco. Fischer, T. B., Gazzola, P., Jha-Thakur, U., Belèáková, I., and Aschemann, R. (2008). Environmental Assessment Lecturers’ Handbook. Bratislava: ROAD. Forest Trends and The Katoomba Group (2010). Payments for Ecosystem Services: Getting Started in Marine and Coastal Ecosystems: A Primer. Available at: http://www.foresttrends.org/publication_details.php?publicationID=2374 (accessed February 20, 2013). GENECON (2014). Forewind LTD, Dogger Bank Offshore Wind Farm Economic Benefits Study Technical Paper. Available at: http://www.forewind.co.uk/uploads/GENECON_DBOWF_Technical%20Paper_CLEAN_FINALv2_130314.pdf (accessed October 10, 2018). Lancaster, D. (2017). Developing Scallop and Geoduck Aquaculture on British Columbia’s Central Coast: Recommendations From Experts. Available at: http://www.aerinjacob.ca/uploads/1/0/5/5/10559030/lancaster__2017__recommendations_for_developing_shellfish_aquaculture_on_bc_central_coast.pdf doi: 10.1007/s002679900224 (accessed November 1, 2018). Lombard, A. T., Reyers, B., Schonegevel, L. Y., Cooper, J., Smith-Adao, L. B., Nel, D. C., et al. (2007). Conserving pattern and process in the southern ocean: designing a marine protected area for the prince edward Islands. Antarct. Sci. 19, 39–54. Marine Plan Partnership for the North Pacific Coast [MAPP] (2016). MaPP Implementation Strategy 2015-2020. Available at: http://mappocean.org/wp-content/uploads/2016/12/MaPP_Implementation_Strategy_web_20161230.pdf (accessed November 4, 2018). SANBI, and UNEP-WCMC. (2016). Mapping Biodiversity Priorities: A Practical, Science-Based Approach to National Biodiversity Assessment and Prioritisation to Inform Strategy and Action Planning. Cambridge: UNEP-WCMC. Sink, K., Holness, S., Harris, L., Majiedt, P., Atkinson, L., Robinson, T., et al. (2012). National Biodiversity Assessment 2011. Technical report in Marine and Coastal Component, vol. 4, Pretoria, South African National Biodiversity Institute. Sink, K. J., Attwood, C. G., Lombard, A. T., Grantham, H., Leslie, R., Samaai, T., et al. (2011). Spatial Planning to Identify Focus Areas for Offshore Biodiversity Protection in South Africa. Final Report for the Offshore Marine Protected Area Project. Cape Town, South African National Biodiversity Institute. Smith, J. L. (2017). “Options for adopting marine spatial planning,” in The Ocean Economy in Mauritius: Making it Happen, Making it Last, eds R. Cervigni and P. L. Scandizzo (Washington, DC: World Bank Group), 329. Smith, J. L., Sims, H. E., and Tingey, R. (2018a). Draft Phase 1 Seychelles Marine Spatial Plan: MSP Marine Areas. Unpublished report to Government of Seychelles, 43. Available at: www.seymsp.com (accessed November 4, 2018). Smith, J. L., Tingey, R., and Sims, H. E. (2018b). Seychelles Marine Spatial Plan Atlas. Report to Government of Seychelles, 95. Available at: www.seymsp.com (accessed November 4, 2018). Verutes, G. V., Arkema, K. K., Clarke-Samuels, C., Wood, S. A., Rosenthal, A., Rosado, S., et al. (2017). Integrated planning that safeguards ecosystems and balances multiple objectives in coastal Belize. Int. J. Biodivers. Sci. Ecosyst. Serv. Manag. 13, 1–17. World Travel and Tourism Council [WTTC] (2017). Travel & Tourism Economic Impact 2017 – March. Published by World Tourism and Travel Council. 20. Available at: www.wttc.org/-/media/files/reports/economic-impact-research/ countries-2017/seychelles2017.pdf (accessed November 4, 2018). Copyright © 2019 Lombard, Ban, Smith, Lester, Sink, Wood, Jacob, Kyriazi, Tingey and Sims. This is an open-access article distributed under the terms of the Creative Commons Attribution License (CC BY). The use, distribution or reproduction in other forums is permitted, provided the original author(s) and the copyright owner(s) are credited and that the original publication in this journal is cited, in accordance with accepted academic practice. No use, distribution or reproduction is permitted which does not comply with these terms.